Large main door of the bathroom open showing the toilet. Shower in corner with flick mixer and adjustable shower rail. Sydney Bathroom Hire are now hiring Portable Mobility Access Bathrooms for people with a disability. These bathrooms are spacious inside and come with a standard dual flushing toilet, a shower with mixer tap and adjustable shower rose. 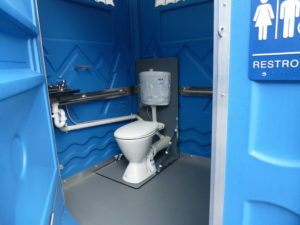 The internal LED lighting really make using the Portable Access Bathroom a breeze. The bathroom also has an exhaust fan. The 50lt electric hot water system supplied with this Mobility Access Bathroom is tempered to 45 degrees C to suit the standard of disability and aged care regulations. A video of such can be provided at your request. 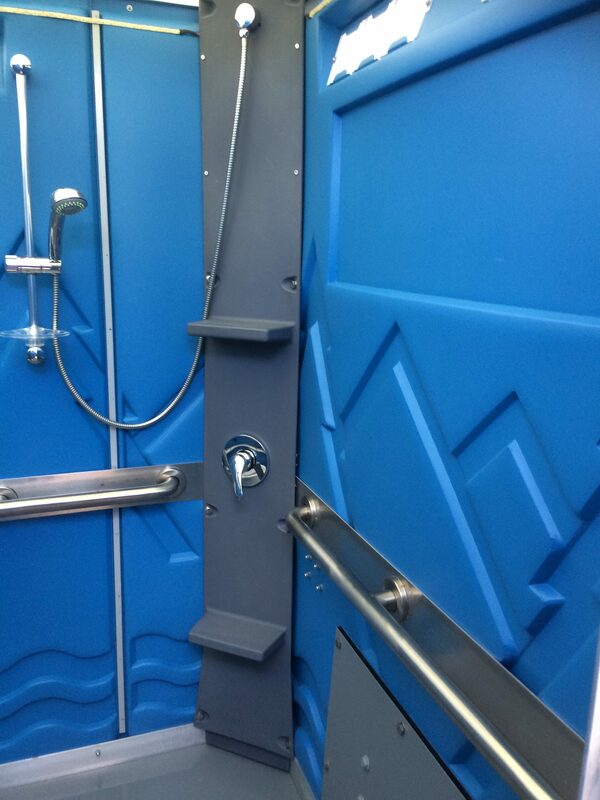 The door opening size to the Portable Mobility Access Bathrooms is 900mm and the door opens outwards. The door has a self closing door closer and privacy lock. There are grab rails throughout the bathroom. The small sink is hot & cold water. 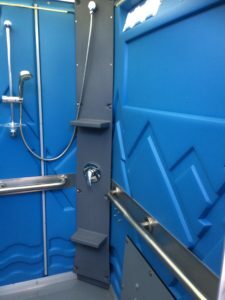 The Portable Mobility Access Bathroom sits hard on the ground with a 15mm lip to negotiate from the outside ground to the inside of the bathroom.